As far as SARM’s go this may be the only one that truly lives up the the acronym (Selective Androgen Receptor Modulator) The reason we say this is Ibutamoren is truly selective, that means no reported sides and no hormonal imbalances to suppress your libido – just a slow steady increase in IGF-1. The benefits go beyond this also but as always different compounds work for different people in different ways. 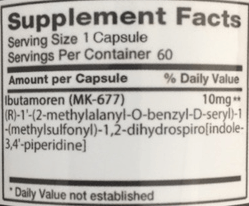 That said this is also great for stacking with other SARM’s due to its lack off sides and benefits to joint health. This compound would also compliment a leaning up or a mass cycle due to the nature of IGF-1 & its ability to tighten the skin. I always want my customers to put their health first but I must say this compound seems the safest yet in the SARM range, so if you just gotta grow then put this in your arsenal! Ibutamoren is a growth hormone secretagogue that mimics the action of ghrelin in the stomach, meaning raised growth hormone and IGF-1 levels without an increase in cortisol. This proves effective at increasing muscle mass and bone density when supported with resistance training. Studies have shown Ibutamoren to increase HGH and IGF-1 levels by 60% in 6 weeks when dosed at 25mg per day and a whopping 72% increase in 12 months. The fact that cortisol release isn’t affected means no increased muscle catabolism. It’s non-hormonal and can be run for at least 3 months with no need for a PCT. By increasing HGH and IGF-1 levels, Ghar1ne will provide users with increased lean muscle mass, enhanced joint and muscle recovery, support a decrease in body fat and even tighter skin. It also promotes the growth of IGFBP-3 secretion. Bodybuilders, athletes and strength trainers are always looking for ways that can help them to improve their performance and gain more muscles. Of course, there are many products out there that can help you achieve whatever you want, however many of these products have side effects that you definitely do not want to be a part of. Some of the most common side effects include high blood pressure, pattern baldness, infertility and many other health related problems. Lucky for you, Mk-677 ibutamoren has been tested and proven to be ideal for bodybuilding and any other strength training activity. Increased levels of growth hormone are usually associated with numb hands, skin problems, weight gain, muscle weakness, lower insulin sensitivity and slightly increased appetite. As you can see, there are no serious side effects here. What’s even more interesting is the fact that, prolonged administration of both growth hormone and IGF-1 hormone cannot increase the production of cortisol hormones. We recommend one cap before bed each night – longer cycles are preferred as there is a cumulative effect with this SARM.